These past few days have been entirely orchestrated by God, of that I am sure. Tuesday night, our church had it’s monthly women’s event, and I was asked to be a small group leader for the evening. One of my dear friends shared her testimony with all of us, and her message was enriched with His faithfulness. In fact, God’s faithfulness was the theme of the night. I am convinced that both the theme and it’s timing were orchestrated with enormous purpose. Most of us say that He is faithful. We worship Him with that word. We pray for that characteristic to shine in our lives. But how many of us really know that it is true? God’s faithfulness is not measured by how many prayers are answered. He remains faithful even when our plans aren’t in alignment with His. My follow-up CT scan was on Monday. Our women’s event was Tuesday. And I received the scan results on Wednesday. In the moment, I wanted the results immediately. Why couldn’t I receive them within seven hours like I did last time? I didn’t understand why. But now I do. Tuesday was God’s time to speak to me. To remind me of His faithfulness, regardless of the circumstance. It was His moment to encourage and empower me, and to remind me of His steadfast love. His timing was perfect. I received the call yesterday morning at 7:03 am. Upon answering the phone, I heard my doctor’s voice. I immediately knew. A tumor had grown near my remaining ovary on the right side of my abdomen. It’s a little smaller than two inches. The cancer has returned for a third time. After listening to the medical details and ensuing plan of action, the conversation ended. My husband slid to the ground with his face in his hands, and began to cry. Tears began to fall from my eyes, as well. Instead of asking “Why?” I uttered, “I don’t understand. What plans do You have for me Lord?” I refuse to question His intentions, but can’t help questioning His plan. The tears of disappointment quickly turned into tears of sadness that I would, yet again, lose my hair. I ran my hands through my thick curls, and continued to express grief over the future loss of my locks. I hate losing my hair. It continues to be the most difficult part of this journey. From the moment I processed this news, a calm confidence has filled my spirit. Where fear, doubt, and worry could hide, confidence has held residence instead. Large Cell Neuroendocrine cancer is extremely aggressive and, more often than not, fatal. However, this cancer is behaving unusual in my body. Unusually good. Sounds oxymoronic considering it’s return, however, it’s seemingly losing it’s power inside of me. Typically, this disease grows out of control and spreads quickly. Because both my hormonal and nervous system (Neuroendocrine) are under attack, this cancer has no bounds to where it can travel. In fact, in many cases, it heads to the lungs and brain rapidly. Yet, for some reason, it is remaining very localized in my pelvic region. It’s attaching itself to surgically removable organs. It is nowhere else in my body, and is no longer growing out of control. The tumor this time is significantly smaller than the second softball-sized tumor that developed within three months. I have been out of treatment for nearly six months, and was nearing the one year mark for being cancer free. All of these facts are good. They give me great confidence that once we remove this last ovary, the cancer will see nowhere else to grow and will cease residency in my body. I’m not dying from cancer. God has bigger things in store. On October 6th, Matt and I will be running our very first 5k. We have been training for nearly eight weeks, and have put a lot of sweaty effort into our goal. This race immediately flashed in front of my eyes upon hearing the news that I would need surgery and chemotherapy all over again. “I WILL run this race. We’ll postpone surgery if we have to, but we ARE running this race.” Matt was adamant that I was delusional, but agreed to speak with my doctor. Explaining that this accomplishment would mean so much, I was insistent that cancer not take it away from me. Thankfully my doctor agreed, and smiling, she told us to run the 5k. Thank you, Jesus! Postponing surgery a few more days than expected should not have an impact on my health. If at any time between now and surgery, we feel the need to move forward with the procedure earlier, we can and will. However, my hope and prayer is that my pain will remain at a minimum and that the tumor will neither grow nor spread in this time. Our race is in ten days. Surgery is scheduled in eleven days, on October the 7th. Through all of this, God remains faithful. Our plans and His are not in alignment, yet I know that His will for my life is far greater than I can imagine. For that reason, I continue to trust in His healing power, and know that He’s got this all figured out. 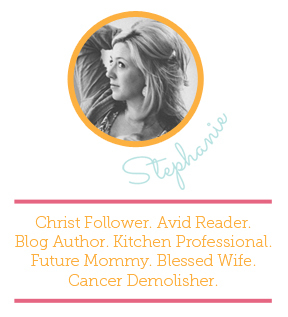 Stephanie your response to a 3rd returning tumor is an astounding posture in the hands of your Creator. I don’t know you (I’m a friend of Lindsay Smith Simon) and my heart fell when I read your post with tears in my eyes. Dear sister in Christ, I continue to join you through prayer for this marathon you in in the middle of. My heart sank when I heard the news, but reading your words leaves me in awe, speechless. Your faith is a light in the darkness. You will overcome, of that I am sure. I’ve begun today praying all manner of prayers over you, your beautiful body, your loving husband. I will pray every day for you. You leave me speechless. The display of Jesus’ power & faithfulness in you is incredible. We love you both very much. Your strength and faith in God’s plan will get you through. Hugs and prayers. directed ways it can be! You are covered by the blood of the Lamb and you are the apple of His eye. God bless and keep you and Matt. I pray with you for God to continue to guide you to overcome this cancer. Your tumor sounds small, you are very strong, and, as you say, the tumor sounds relatively small. Disease will surely find you a mighty foe. Hugs! oh, Stephanie, your life is so precious! Thank you for allowing us this glimpse of your heart and all that the Lord is doing within it through the struggles and heartaches… We weep with you, we rejoice with you, and we are led to TRUST with you…May He continue to do what the God of all comfort always does…COMFORT YOU…and thank you for being such an example to us all! Thank you for being faithful even when you do not understand. His love shines through every cell!! Love and gratitude to you for your attitude, and your sharing, so we can be blessed!